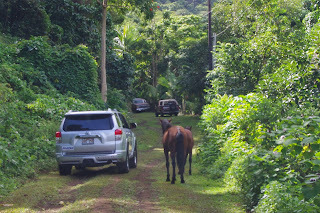 I challenged Waipio Valley hike. 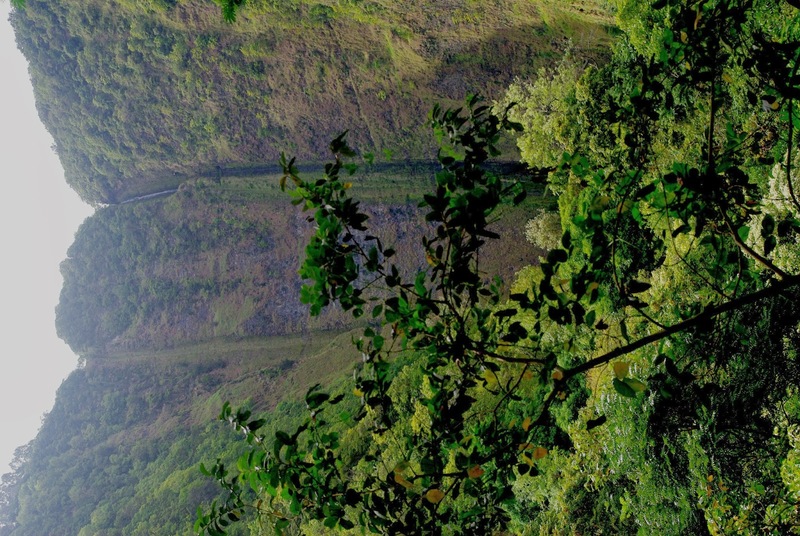 This photo is the valley from Waipio Lookout, the standard tour point of Hawaii. Marvelous View! It is very hard way to go down the valley, 800ft down while 1.6ml, a road with an inclination of 25 degrees. It is roughly paved but many part of this raod is one lane, so we cannot go with ordinary car. This time I went there with my friend's 4WD car. The ahead is the car of the former student of my friend, he offered our guide to the Valley. The road of the bottom is such condition and free-range houses ( wild houses?) walked along the road. Of course also many droppings. We went through the narrow road in the woods and it was stopped by fallen tree. The former student took out a hatchet to open the road. The end of this road, there is a ruins. That was constructed for the cafe of sightseeing spot but gave up to construct by opposition movement of residents and the conservation movement. One side of the cafe was faced the sea through the valley. 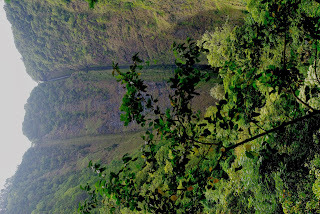 Opposite side was faced Hiilawe falls, it is the tallest water fall in the State of Hawaii. It is such a wonderful location indeed. But gave up construction and sold it to Bishop Foundation for $1 or not. Today there is little water at the falls. To enter Taro field they sang a chant to ask permission to the spirit of the valley. Waipio valley has the most powerful Mana (spiritual power) in Hawaii Isl. The lady with white shirts is a high school teacher of the Hawaiian Culture. She took four students to training actual work at Taro field. Going down here there is Taro Field.